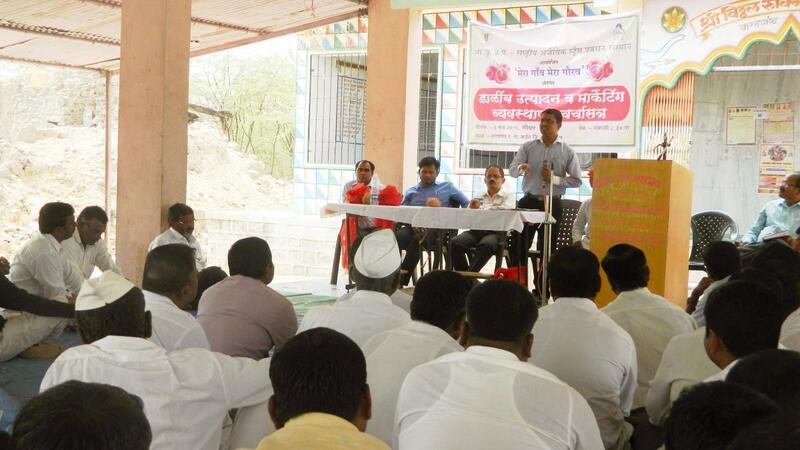 Under ‘Mera Gaon Mera Gaurav’ programme, a Discussion Forum on “Pomegranate Production and Marketing Management” was organized by group of scientists ICAR-NIASM on March 6, 2016 at Baradgaon Dagadi village of Karjat Tehsil, Dist- Ahmednagar of Maharashtra. The basic objective of the programme was to understand constraints in production and marketing of pomegranate, giving back solutions and creating awareness among pomegranate growers about latest technologies and innovations. About 150 pomegranate growers from nearby 15 villages of Karjat tehsil i.e. Baradgaon Dagadi, Baradgaon sudrik, Belwandi, Rakshaswadi Bk., Pimpalwadi, Kopardi, Kuldharan, Ganeshwadi, Talavdi, Dhalwadi, Durgaon, Hingangaon, Taju, Shinde, Jalalpur, etc. participated in the forum. The team of scientists, comprising Dr. A. L. Kamble, Dr. N. P. Kurade, Dr. Ranglal Meena and Dr. A. Balusamy, interacted with famers and discussed on package of practices ranging from input procurement to output marketing i.e. selection of appropriate land for pomegranate cultivation, land preparation, selection of variety and planting material, water management, nutrient management, pest and diseases management (diseases like bacterial blight, wilt, anthracnose, fruit rot; pests like fruit borer, thrips, fruit sucking moth, shot hole borer), nematode management, fruit disorders like fruit cracking & sun scald, rest period management, pruning and bahar regulation, prices and arrival of pomegranate in various nearby markets as well as future export prospects of pomegranate in India, etc.